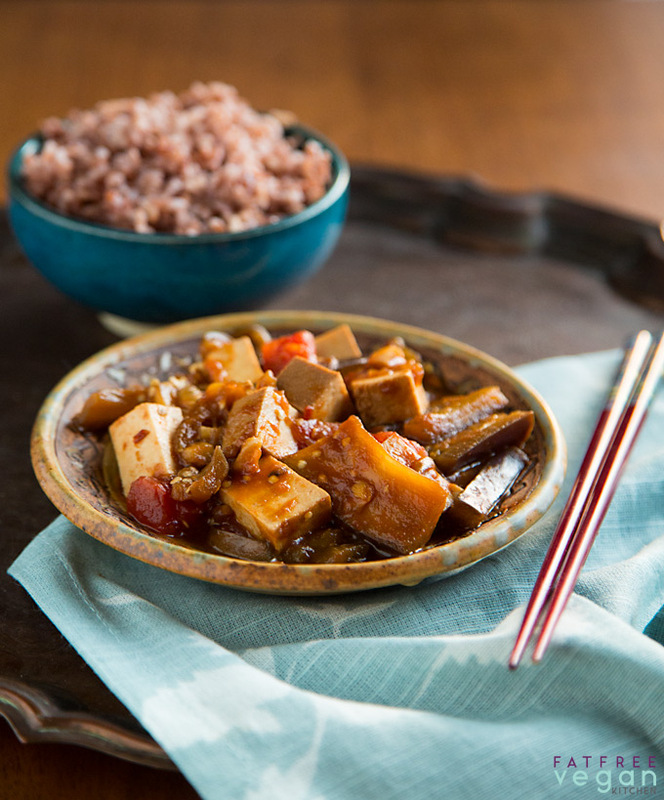 In this vegan, Szechuan-inspired dish, eggplants and tofu are cooked in a spicy garlic and ginger-infused sauce that will make anyone an eggplant lover. I know some of you are probably tired of seeing eggplant here. Eggplant recipes appear on this blog so often that I could probably change the name to FatFree Eggplant Recipes. But there’s a reason for that: I love eggplant! I think it’s one of the most versatile vegetables around. If you’ve been avoiding it because you’re afraid you won’t like it, I think it’s time you gave it a try. And this is the recipe you should try. It’s so good that even eggplant haters (like my daughter) like it. If you’re eggplant-phobic, do as I did and find some smaller, light purple or white eggplants, like the ones in the photo on this page. They are usually denser, less spongy, and less bitter than the larger eggplants. In this recipe, the eggplants are peeled, which makes the texture more appealing to eggplant virgins, but you can also use Japanese eggplants with the skin on. They get soft rather than chewy, so be prepared for that before you chow down. Take a moment to savor the aroma of garlic, ginger, and sesame and then dig in. You will not fear eggplant anymore! This Szechuan-style dish gets its heat from the chili sauce. Look in your Asian market for chili sauce or garlic chili sauce that has red chilies as its primary ingredient. Try to find the kind with the seeds intact, not the smoother type. Then adjust the amount to your desired level of spiciness. While the eggplant is cooking, make the sauce. 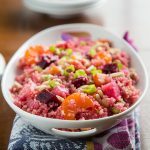 In a small mixing bowl, combine the 3/4 cup vegetable broth or water, hoisin sauce, soy sauce, rice vinegar, sesame oil, sweetener, chili sauce, and tomato paste. Add the sauce to the eggplant. Simmer uncovered until all the eggplant slices are completely cooked–they will be very soft and start to fall apart. Add the tofu cubes and tomato and cook until heated through. Serve over rice, sprinkled with sesame seeds if desired. Reduce the sodium by using water instead of broth, regular rice vinegar instead of seasoned, and reduced sodium soy sauce instead of regular soy sauce. *Sesame oil gives this dish its authentic Szechuan flavor. You can leave it out, but the taste won't be the same, so I recommend reducing it rather than eliminating. The nutritional data below includes the full amount of sesame oil. Check out the other eggplant recipes on this blog? There’s a whole section of them! 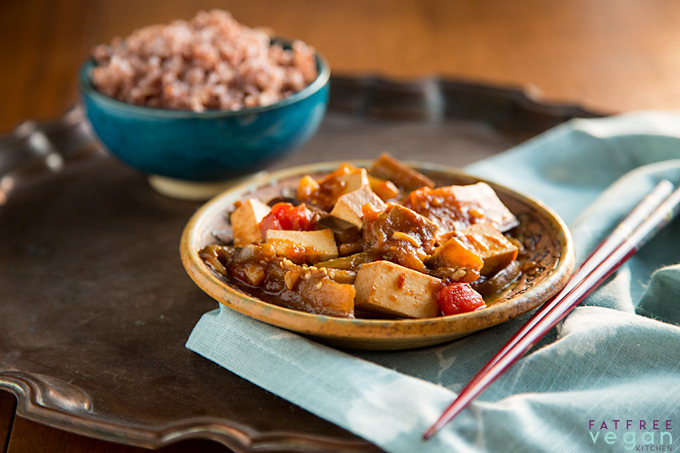 Needed something to make with eggplant and tofu and not much else. Had no tomato paste, and used some good thick sesame teriyaki instead of hoisin… and threw in some asparagus towards the end, cause it needed to be used today. Verdict: sooooo good. Thanks! Fantastic recipe! 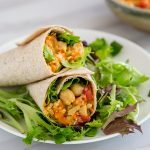 Didn't change a thing and it was delicious – love your blog! Thanks, I'm going to try this tonight. Ooh, i’ve been singing this one’s praises for years. Like Rachael, i often find myself with an eggplant to use up and not much else, so this is probably the FFV recipe i make most often. Relatively simple to make and tastes great! I know this is an older post, but I’ve had it printed out and tucked away in my recipe book for about 2 years now! 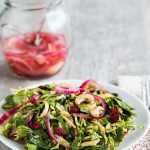 A few weeks ago I re-organized my recipes and moved this one in to the “must try soon” category. And I am so glad that I did! I added some zucchini and yellow squash to the mix and ate it over spaghetti squash instead of rice, but the flavors were fabulous! Many thanks. I didn’t have eggplant, but I did have the last zucchini of the season. I pretty much followed the recipe — swapping out the zukes for the eggplant and serving the chili-garlic sauce on the side — it was still delicious (even for all members of my somewhat picky family!). 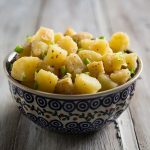 Has anyone tried the garlic eggplant dish from Panda Express and do they think this recipe tastes the same? I absolutely love the garlic eggplant dish from Panda Express but rarely eat it because I am sure it is probably plagued with a lot of things that aren’t very good for me. I would love to be able to make something similar at home that is healthier. I suppose if no one responds, I will just have to try it and let everyone know! I made this last night as I had a big eggplant in my fridge that I really wanted to use. I used Mushroom based stir fry sauce instead of hoisin sauce just cause thats all I had. I also topped it with spring onions (green part) instead of sesame seeds. The dish was YUM!! Can’t wait to eat leftovers tonight! Thank you Susan for giving us yet another amazing recipe! Just noticed Gayathri’s comment: that’s funny, I also topped ours with green onion, though I didn’t omit the sesame seeds. Having both as a garnish made for a very attractive dish. Which reminds me of something else: my version of this dish didn’t look at all like the one in Susan’s pic. It was more brown than red, except for the red from the tomatoes. It looked (as well as tasted and smelled) awesome, it just wasn’t what I was expecting it to look like based on her photo. Thank you for this one – it is one of my favorites. If I can get them, I love it with the Japanese eggplant as their skin is never bitter or tough. Like others I have topped with green onion – or whatever green herb I have available (basil, chive, culantro) and like the green finish. An additional tomato makes more sauce which is nice. 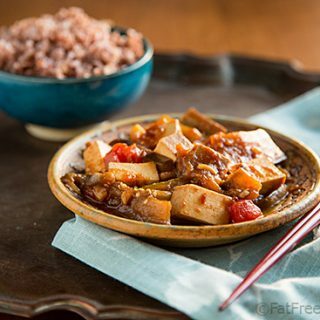 I was looking for a recipe using eggplant and tofu and found this tonight. It was fantastic!! One of the tastiest things I’ve made in a while–the combo of sauces is just right. Thanks!! Great recipe. Just the right spice balance. Used teriyaki sauce, instead of hoisin (I live in the sticks and couldn’t find the hoisin.). I also added a coarsely chopped red pepper and green onion at the end. Is the eggplant mushy at the end? That’s the one issue I have with most eggplant dishes. I can’t stand the mushy texture but I am fine with the flavor. It does get pretty soft, so it may not be to your taste. 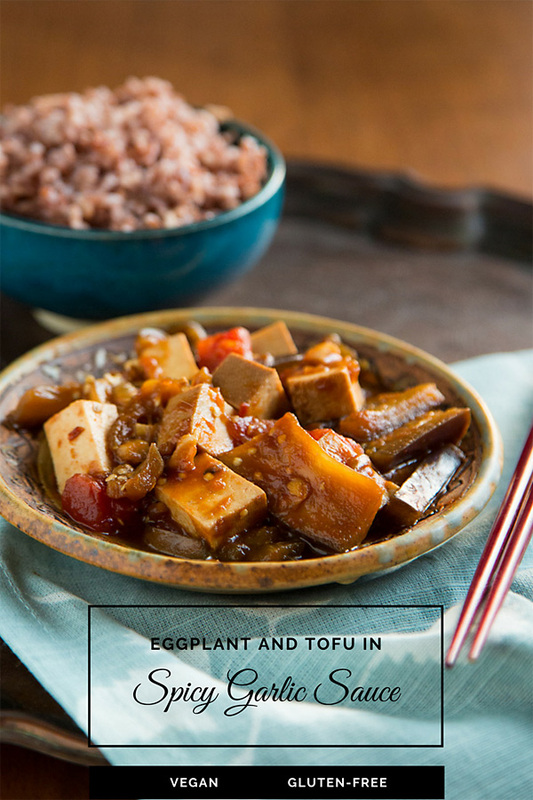 I just want to say thank you for this delicious eggplant and tofu recipe. It reminds me of Szechuan eggplant. I substituted red pepper paste for the tomato paste. It’s very tasty. I only wish I could expand the palate of my husband and children so that they could enjoy it too! Thanks again. I will check out your other recipes. I didn’t have any tofu but used broccoli instead, and this recipe is such a winner! My market had both the Japanese purples and the tiny white eggplants. I will definitely be making the sauce again soon for my stir-fries – wow! I love your spicy recipes. I make this frequently. I don’t change a thing because it’s flawless just like this. I love it! I have been getting so many eggplant in my CSA this year that I finally tried this recipe. Twice. The second time i omitted the tomato paste and thought it was much better. Both delicious. With Japanese eggplant, I did not peel them, but the first time was Italian and I did. I could eat this every day! Served over jasmine brown rice with steamed broccoli and cantaloupe slices. Made this tonight for the first time. Won’t be the last! Only had a few small eggplants so added in squash and zucchini. Didn’t have chopped tomato either. This was soooo good. Can’t wait for lunch tomorrow to eat the leftovers! Great recipe! Made this for my family this evening and everyone really enjoyed it. I added ground pork and whole peppers to give it more bulk/heat and it tasted amazing.